I managed to borrow a second Xbox again tonight from my friend (thanks Paul). This has allowed me to test my new changes. All minor, but still important to check them over of course. 1. After loading a save game, reset the sound volumes correctly to loaded settings. 2. After you have played a game, reset the high score sharing timer to get more instant sharing. 3. Added a helper sprite to the purple powerup asteroid. 4. Made powerup asteroids easier to kill. way more fun now! 5. Now auto saves after actually receiving a high score from someone. I also played around with a good suggestion of doing a Reply when it is game over. Only i couldn't get the buttonhelp to look right (i have those button defs rather large). I didn't really want to remove my 'shout ya score' so unfortunately it isn't gonna go in, bah! Not sure i have anything left to fix up for the update. Sooo maybe this will just need more testing and then be ready to go. I noticed this a few days ago. I never thought i would make it onto this esteemed list in my life. I just don't have the time to commit enough of it to Peer reveiwing anything that goes. In fact i won't Pass stuff i don't like, and that holds back my score quite a lot. This score does have some importance though, and even to me it is a good marker to see if you are even bothered to review someones game or not. Is my score as high as i would like it to be? Nope is the answer, and yes i can most definitely do something about it. But it will have to be when it feels right, not just to make a few more rep points. I have been very busy with my competition this week and also monitoring all the stuff going on. I have f course been fixing a number of minor bugs that have surfaced since release as well. I expect to have a new version ready for Peer Review by thursday sometime. This new version will also address the purple asteroids hit point issue. Once again i say Bah! Back to my Rep points for a moment and i have to say that i am proud to make it onto this list. Keep up the good work all you other dedicated people, i hope to return to this list soon. Well A Shooter has of course been out now for 3 days. In that time i have managed to get quite befuddled as to why it only manages to generate 3 stars of rating. Also why the conversion rate is so low for one of my games. I know some people will think i am just full of it, and they are entitled to their opinion. However i take along time over my games, i also take a very long time researching and implementing things that people will like in a trial. so far i have done very well. Till this game. I was baffled. and then it came to light thanks to several people on my twitter list. It seems the main issue is that people were not finding the powerups, and as that is Very central to my trial experience, it is no wonder people are turned off. Without collecting those powerups, you will die. It is as simple as that. also when you start my game you have a very short firepower, and then whammo 15 seconds later it is powered up to twice it's length, also with more fire speed added. so without all that it is bad news for me. I know i won't really get a second chance at this, but i hope that myu competition will keep enough people interested until a patch can be released. I have it mostly finished now, i am just making a few minor adjustements and a few bug fixes etc. If only i had known what i know now. It is not like anyone came up with this issue while in playtest or all my focus testing. 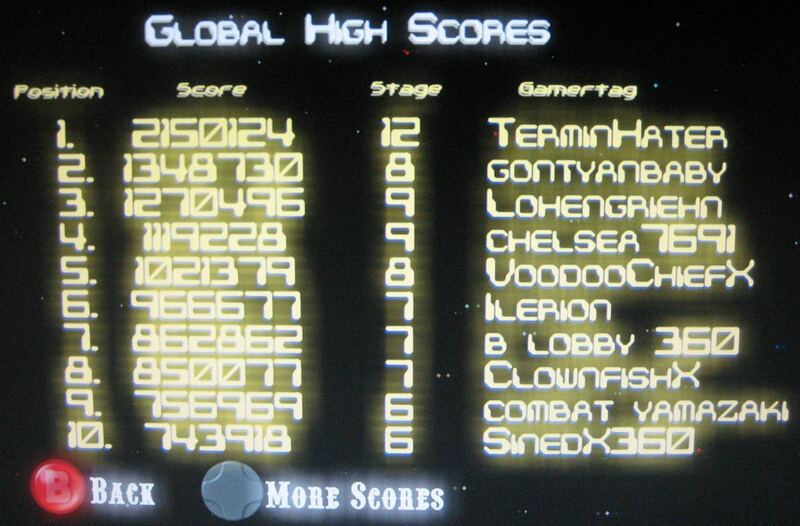 Here is the photo i took of my Xbox screen while on the Global Highscore table. As you can see Terminhater is number 1 by a country mile, but i had to disqualify him for the simple reason he worked on the game. Sorry Terry. so the prize for this weeks competition goes to Gontyanbaby. Who i sent off a friend request to earlier this evening. Once i have his tshirt size and address, a tshirt will be winging it's way to him. SinedX360 has already won a Tshirt as well. I look forward to receiving scores all week from people playing the game. It is very very exciting for me to see these scores being posted to me. I also realised that the time difference for European players could leave them at a disadvantage. So i will be setting up times that will be in the evenings for them. sorry i did not consider this before now. Check the competition rules and info HERE. There have also been several mentions of the competition and i really need to find those links. Also i have 2 reviews so far. One at Nukezilla.com and the otther at Nave360.com. 1. Download A Shooter from the Xbox Dashboard or online from here. 2. Rate A Shooter as many stars as your consience will allow (the more the merrier). 3. Tell other people you know that have Xboxes to at least downbload the game. So you see i am not asking much. The number of downloads is critical to getting on another list and the rating is critical for yet another list. Getting on lists is the big thing for Indie games, get on them and your chances of success rocket extraordinarily. So please help me get the game on a list. Now it's onto the Marketing work. I have just put the promo video onto Gametrailers.com, check it out here. The comments section will fill up i am sure with plenty of good comments soon enough. If you can vote, please do so. I now have the codes to send off to reveiwers and i am very excited about that. Though at the moment the game is not actually Listed either in the Xbox dash or the Xbox.com game listing. I expect that will change in the next few hours. I would love everyone to download the game, Even if you are not going to buy it. the downloads might get me into the top downloads list and more xbox owners will see it that way. All help is greatly appreciated. Now i am off to start divvying up the codes. When a game is about complete or is completing, it is a very busy time for any dedicated developer. Every time i come to this period i am amazed how little sleep i get and how hard i am working. This time also much worse than any time before. Although i already have 3 titles out on Xblig this is the one i have put the most surounding effort into. What i mean by that is Pellmell is the game i spent developing with the most effort (expect an update soon to bring that prixe down!!). A Shooter is the one that has been in development for the longest time. Though a lot of that time can be attributed to the Kickstarter project and me trying hard to get more in than any sane man can. So every time i put out a game i learn a little more about what marketing is. I come up with new ideas. Some don't pan out, like the kickstarter project, or the demo days at a local Gamestop. Still i have a need to try and help my game succeed. I see too many good games on Xblig fail for some inexplicable reason, and then there is the otehr side where i see crapplications and barelygames do ridiculously well. So i figure the more i can do to get the word out the better my edge is, the stronger hand i hold at the start of the release. However it is hard work and requires a real commitment. 3 hours of fixing up an Excel sheet with email addresses etc for contacts in the press is nothing really. Yet i believe that more than 90% of games that come out on Xblig have no support or marketing whatsoever. So each time i put a game out and learn more of what can be done to promote my game, the more time the next one takes upon completion as i put that new found knowledge into action. Lets hope that the Competition i am going to run will place me above the crapplicaions at least on the downloads page. One day i really hope to expand the number of games i do and also the size and scope of those games. What will be next i wonder... Steam? A New Title? Time will have the answer, as it always does. At least today my internet is working again, yay! Though i have been told by a number of people that competitions have drawbacks and are dangerous. I cannot help but be drawn to them to help me get the word out about A Shooter. Having those darned Global Highscores has to be useful for something more than seeing how good people have gotten. I believe they should be able to help me sell A Shooter and also get the word out that it exists. I know i have spent quite a lot of money on the T-Shirts and Hats, but i hope to recoup that in extra coverage by the media. Maybe it will work, and maybe it won't. I am not shy about trying new things that is for sure. This competition however does not really feel new per se, but more a visit to a bygone age when games had competitions attached to them. Now i am suffering a lot of internet outtage here at home at the moment, but i hope this posts when it comes time. But here is a quick description of where i am at the moment. I have the competition page setup (Check it here if you are interested). Well i am going to contact the guy who send out my Press releases at Mitorah Games. He does an excellent job and for a low fee (imho). I will be trying to get me press release out for Friday if that is possible. A Shooter looks like it might go Live about then and i really want to hit on all cylinders at the same time. this means release of the game to Xblig and also the press release. I sure hope i do not fail Peer reveiw, or this is gonna get really annoying. I am worried that soemthing will go wrong, there are many things that could fail of course. Time will tell how it goes. So without further Ado, here is what i have currently. Los Angeles, CA. -- September 24, 2010 – Sorcery Games (http://www.sorcerygames.com) announces their latest release for the Xbox 360. ‘A Shooter’ is not surprisingly a side scrolling shooter. Finding shooters hard to get into? The starting difficulty too hard? Then you need to play A Shooter on your Xbox 360. This game starts off in a measured way to introduce novices to the art of side scrolling shooters. Later as you achieve Mastery of the shooter elements it packs the screen full of interesting and daunting enemies to crush. The aim of the game is simple… to Power up your ship with the abundant powerup containers and blast the enemy spaceships into oblivion. Sounds simple we know, but the game has beautifully balanced gameplay for novices to pro players. Feel that sense of worth build as you battle End of Level bosses and defeat their overconfident attack plans. Think you are good enough to take on the final level and the End of Game Boss that inhabits it? I challenge you to try. With carefully crafted gameplay to handle 2,3 or 4 player cooperative modes, you know you can have a blast with friends and family. And those friends can help you proceed further in the game. The game boasts excellent friendly features such as Permanent powerups, Infinite level restarts and lots of enemies to take care of. You can get all this for only 80msp and it comes with smart bombs, Woah! That is astounding value in any monetary system! And there’s more. Think you are already a shooter God? Then put yourself to the test and show everyone just how good you are with the Global High Score sharing in the game. Can you be top of the Global chart? The update for Dreamland is finally out. I sure hope this will increase sales by a large factor (like 3 or more!!). This game is now finally at the right price point for what i think it is. So maybe from those 500 downloads a week i can grab maybe 50 or more sales. I can hope!! Take a nice break and sip a BIIG cuppa tea? Nope is the short answer. In fact i started this morning by peer reviewing 4 games. I know i should have been working on the Press release, but i gotta pay my dues. In fact i quite enjoyed most of them, so it wasn't torture, but it does take me a fair while to get through them. When i am in the middle of developing a game i do not have much bandwidth to do much reviewing and i tend to prefer Playtest anyways. So they are the only games i usually do, unless it is one of the Peers i chat with regularly on Twitter. My Tweeple can have my time anytime! So yeah, ya mighta guessed it. I have not done the press release yet. and to be honest i am not in the mood tonight either, or not at this point in time. So maybe tomorrow sometime, i will see then. What is bothering me is still the setting up of the competitions for the t-shirts and hats i bought. What if the high score sharing component doesn't work out. I guess i could cancel the comp till i do another version, yeah maybe thats it. Well i have spent an hour testing my games review version on the xbox and it seems aok. time will tell on that one as well. It is sunday, it was all day, and i am told it is a day of rest. I cannot honestly remember the last time i rested on any day, never mind if it was a sunday or not. So this morning i started off by taking the family off roading. It went very well and i think everyones skills improved a bit today and we got through about 25 miles or so. I loved it, though it can make me a bit nervoud watching me kids do something for the first time, like scaling a steeper hill than they usually have a go at etc. Later we managed to go shopping and eventually i ended up at home for a nap :) I managed to take about an hour and this pleased me greatly cos i was slated to play tome mixed doubles tennis at 8pm. Though that got cancelled at 7:50pm. Ahh well. In the mean time of the afternoon and later evening as well as playing Wow with my friend and warcraft3 with my son. Who i recently inctroduced to the RTS genre i was thinking about what is next for A Shooter, or more pointedly, what do i need to do before it goes live. Not that it is likely to the first try, but ya never know. It was in peer review a lot of times and for long periods. So the answer is simply Press Release. However my press release for this game must have some details about the competition i will be running when the game comes out. Hmm, i will think more on this and blog when i have more info i reckon. Posted by VoodooChief at 11:14 PM 0 comments A Day of Rest? So i am finally getting into the HD revolution, though i think the revolution happend several years back. I am actually gonna setup a new tv and it is an LCD HD one. Awesome i hope. Well anyway today apart from setting up my living room for the new TV, i have been working on A Shooter. Taking into account the latest playtest feedback. Mainly from Chris Hughes, who is a top lad and someone i respect for trying hard to do Indie with Honor. So today i added my last piece of music, the commisioned piece by Liam Tarpey that will be SorceryGames theme music. After adding that (you will hear it on the credits) i got to work on the Bosses. The issue with the bosses is that they all look the same. So people will think they are the same. Even though they are all orignial and evolving. So what to do. Originally (this morning) i asked my artist id he could supply another definition at least. But then i realised i should take Chris's other comment and just see what happens when i tint them. And lo and behold it looks sweet. I have about 8 colors and then just reused a few and i am really surprised at the results. They look really good and i think this has added the missing element to my Bosses. G'night, i have to get up early in the morning to go off roading with my family up at Rowher again. I love off roading on my Honda 450x..
A Shooter Video is done. Yep it is true. After too many hours i have the new promotional video for A Shooter. Check it out below. I don't think it came out too badly. My only real disappointment is that i am only showing off a fraction of the enemy types that are in the game. Posted by VoodooChief at 8:27 AM 3 comments A Shooter Video is done. Today Mass Media Games 'The Midway' update went live. I was personally working on this improved version of The Midway. I am so happy to see it up there and see the annoying bugs fixed. Ok, so most of the bugs i fixed were even noticed by the general populace, but it mattered to us, to me. The main fixes are generally cosmetic, with spectators now seeing Frog Flinger players frogs being propelled correctly after the player reaches level 5. We also altered lighting on the prize board towers and that makes them much easier to see. They now read much better and I like em. Then there were improvements to the scrolling messages, and that bug fix wil make it so all 5 slots can be changed and not only a select few (bad bug, get squashed!). There are a couple of more major fixes, but again i am not sure anyone really noticed, but if they did i thank you for not raising hell about it. We made the whole scene more efficient, raising the base frame rate and also making the scene load faster. Then finally our last fix was for the Freeplay Frenzy. Did you notice how occasionally everyone seemed to know which game was going to be free and already be playing it? Well we had a bug where there could be a disparity between each players timer. This could cause a several second difference in when you saw Freeplay Frenzy being on. So sometimes you would be first easily and sometimes feel like you were last. Every player was however awarded the full minute to be able to try and get into the game. Now the timing issue has been fixed and now everyones Freeplay Frenzy will happen on the same second. That's about it. I sure hope you are all enjoying your Midway. So someone asked me how come i spent so many hours working on a simple list of reveiwers. Well i thought everyone would understand but apparently not. So here is some clarification on what i spent so much time on. And of course expect to do the same. Every time i wanted to add a contact to the list i would have to go to their website and make sure they still existed (yes even the ones i visit a lot). Then i would find the contact info as best i could. A lot of websites seem to hide this information. Or at least make it hard to decipher. Once i knew they were still around, i would check their review status to make sure they were still reveiwing Xblig games. Some sites change their focus and some just go stale. Once it passed that test i wrote down the info i could find into the Xcel sheet. Simple to do all that eh!. Well lets break it down a bit into time. So there we have it, about 10 minutes per entry (ok this seems a lot more than i spent, but some places were easier and faster. So i am sure that the average is much lower). I went through about 20-25 pages so i know i did not actually spend 10 minutes per, but in about 2.5 - 3 hours work i got through them all. Some were rejected, some were not. i ended up with about 15 new sites i think, so not bad in the end, but funnily enough 15 added over 3 hours means 12 minutes each. haha! So time consuming, i am so glad i can now just add to this list in the future, though i feel i will only be adding ones that reveiw my games. The main reason is that i now have a short list of 11 sites that have reveiwed my own or my Peers games. That is an awesome start. I am STOKED that i now have the possibility that i could get 11 reveiws for A Shooter. I have been diligently working on the Reviewer Excel file that Chris has sent me. I have added bunch of new reviewers and emails etc. This is good, however it has taken me several hours up till now. Ouch! I have not been doing much since working on this apart from doing a bit of editng to my A shooter Promo video, but i haven't spent long on it. Which as it just so happens is what Peers have done with the game in Playtest. I think i might just move it over to Review and save everyone the Reviewing fatigue. Might work out better that way. Tonight i expected to be Peer reviewing a Peers game 'Hypership Out of Control'. But that has not come to pass, as it had already passed Peer review when i finally got home and setup (it is quite late already). so i realized i need to work on some stuff for A Shooter. Currently i have not recived a score from anyone on my mostly running game on the Xbox. This is not a surprise as noone has the time to playtest currently. I am sure it will get a thorough testing once it gets into Peer Review, maybe the end of this week if not sooner. So i have 3 major things to do on my list, does yours look like mine ? 1. Press release ready to go. 2. Sort out and get the Excel file of reviewer candidates updated. 3. Get the Promo video done and placed on Youtube and Gametrailers.com. Tonight i really should have done number 2. I was finding it hard to concentrate though and was failing at being able to do this. so i decided to try to work on my promo video. I didn;t expect to get very far, but i am now pleasantly surprised to find i have cut my 5 minutes of video down to 1:20. This is now getting much closer to what it should be. Once i get a couple of video shots that i somehow down't have of some smart bombs going off. I can then do the intro and credits and finalize the order of the set pieces. Then it will be the music and sfx overlays. This all takes so much time, and i am not sure many people really appreciate it. Still, tonight took me a long way towards getting the video done. I do not believe this will be one of my best, but i hope it at least gets some interest. Yesterday was my birthday. Yeah, it is on that infamous day now in American history. 9 years ago it was a shocking wake up call from a friend of mine called Ian. Today it is a sad memory of how people died and how people fight over stuff. Real or imagined it makes little difference to me. Killing people just seems so wrong. Although i must admit to knowing people that make me feel like i need to kill them. Alrighty, so that last sentence was not actually true, it is a figure of speech only, and i am glad it is. So apart from helping ferry my kids around and having to go into work for a few hours it was a rather uneventful day. I did get some great birthday cards and this year for the first time i got a whole load of birthday well wishes from friends and family via Facebook. That was very very nice and made me feel all sentimental i can tell ya. Sunday morning was to be my birthday time and i took the whole family off roading at Rowher flats off of Sand Canyon exit of the 14 just outside of Valencia. We had a great time and the kids and wife rode very well. I even got to have a go at some of my more intimidating hill climbs and this time the shoulder held up to the abuse. That certainly made me feel better. We rode to the top of the mountain up the fire road and generally razzed around a lot. I made a new friend in a guy also called Robert who lives close to Rowher. Later we managed to get clean and go visit my friend who has a new puppy and steal his warcraft 3 disks while also delivering his Xbox back to him. He had loaned me this so i could do high score sharing code. Hmm, i just realised i have not released that to the general public yet, DOH! i need more time! After that it was a quick visit to grab a malt shake from Carls Junior and home to watch the ens tennis final. Only to be told that it was rained out and might now happen on Monday.. How the heck am i gonna tape that now? I am noteven sure they know what time it is gonna be on. bah! Stupid USTA. I am now pretty tired, and looking forward to some hard earned sleep. Dreamland is still in Peer review and so far has maybe 3 reviews, which is ok with me. A Shooter has had a single playtest so far, and no scores have been shared to me :( Though i keep leaving my xbox on all the time with a score from me. Though over night it turns itself off, also during the day when i go to work. Should i Doom my latest playtest version by saying that this will be it's last time in there before Peer review.. Yeah i guess i just did. 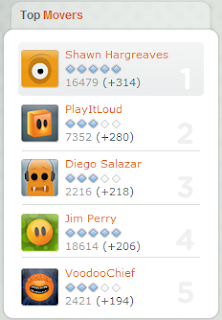 There is a very large discussion going on about high score sharing on Xblig at the moment. I have several comments in there myself. There are a few groups of Developers or opinionators on every side at the moment, and no clear winners so far. Although i feel that some posters feel they have won or are winning something. Mostly i just think we are just headed for more rules, more restrictions and a lot more time in development and also review. I am done with this topic for now, though i expect to ruffle some feathers with A Shooter as it does indeed have High Score Sharing. and not in a way that some of these Peers feel is acceptable. I will take my chances and see what goes down. I will not break the rules for my game, however i will argue what those rules should be. I had another fun time today playing poker in our little sandbox. This was our first real test of the updated Brimstone Poker table. This new version features a choice of what type of Poker to play and we needed to test the No-Limit tournemant mode. I am glad to report that although there were several bugs, the testing went quite smoothly, and i had a good time. Though the cards were mean to me today. We do not have a release date for this atm (not that i am aware of anyways), but i am sure everyone will really enjoy the new version when we get it out. Last night i worked real late. I was tired and fixing some bugs and little things in A Shooter. Then i made the ccGame i wanted to for the Xbox Playtest. Instead of immediately uploading it to MS i decided to download it to my Xbox an give it a final test. I always try to do a final test. Then I look less like an idiot when the version goes up and the first person to test it finds something horibly wrong right away. So luckily for me i did this as i noticed i hadn't redone the default high score setup, DOH! 5 seconds later that was done and i had a new ccGame. It was however at this point i realised how tired i was at nearly 2am. I also realised that i would not be able to really objectively test the ccGame on the xbox either. I reckon i would miss something. So instead i went to bed... and slept like a baby. This morning while i was eating breakfast and regaling the wife with my tales of working while tired into the early hours of the morning. It became apparent my wisom of the earlier session was to hold true. As just eating breakfast made me realise that i had not removed the level jump cheat, bah! So glad i waited, maybe tonight i will get it right and then into playtest. I think i have it all sorted now. 1. Made the save faster by making it save so much less xml, down from 2MB to 64KB. 2. Fixed a bug my friend Ben told me about with the stars that fall from the bosses. 3. Made it so local profiles cannot be entered into the Global scoreboard. I believe i have left silver in there, but i am not sure about the privilage call i checked. Oh, i think that is it. I will have to give it a proper once over tomorrow before i put it into playtest, but i think it is ready at this early hour of the morning. YAY! i finally have managed to upload the latest ccgame for A Dreamland Chronicles Game. It has taken me a while but i really think this is a good move. Now the game will be a dollar once it gets through and goes live. Replacing the 3 dollar version that is currently up there. Last month (august) it got downloaded an amazing 455 times. I think this is awesome. However it's sell thru is only at 2.?% and that is bad. I hope that this new price point will get the conversion rate up above 10%, and therefore be making me more money and making the whole thing a lot more popular. It is a pity i cannot easily let all those people know that the price has been reduced (so far about 6K of them). ahh well. at first i could not get the game down low enough, because i did not want to pixelate the beautiful artwork for the sake of more sell thru. Since that time i have ben able to get Xact to compress the Audio saving me about 12MB. Then i realized that some pages did not have to be so darned large. That was enough to just get me under the 50MB limit for 1 dollar games. So hopefully it will be out in about a week or so, and maybe my sell thru will go through the roof. I can always hope. I can also hope that it will get many more downloads as the price point is lower. Time will tell, and i will post about it in approximately a month. The Promo Video - is it important? There seems to be two theories on this that i can ascertain from reading blogs and forum posts, and also talking with other knowledgable people. These two are not opposites and can certainly both be true. In fact I personally believe them both to be true. Though there is one aspect to making a video of your own game that goes beyond money. It is 'Worth'. If you believe in your product, then you should have no problem being able to come up with a short Promo video for it. If you do have a problem, then maybe something is missing or just not quite finished yet. I make videos for all my products. In fact i rather enjoy the challenge of putting al my work into about 1 minute and thrity seconds of video. Adding titles and overlays and transitions as i think will help make it more appealing and palatable. I now have a basic script for the A Shooter video and have already recorded all i need (or i believe i do). So tomorrow i get to start on editing the video together. Chopping and hacking and splicing a small video together from about 20 minutes of footage. It is a time consuming thing to do, but i am usually proud of what i end up with. as i was especially so with Pellmell. 1. If it makes little difference because noone sees it, then it is what it is. I will put it out there and shout about it the best i can. Publicity for an Xblig product is just hard to find. 2. I think the video if done well will certainly help sales. It will mostly help downloads. Though again, i will need people to see it. Posted by VoodooChief at 12:37 AM 0 comments The Promo Video - is it important? So of course i have gotten around to grabbing a buncha screenshots with multiplayers playing. It was actually rather a lot of fun. I got to brin my wife and kids into the game and play several levels. It was quite fun, and i had a monologue going telling each one to avoid the bullets that were chasing them. with my kids laughing and pushing each other around, or racing to be first to a powerup. A lot of fun. I grabbed 145 screenshots which i have reduced down to a measly 11 now and added them to the games press pack. While i was doing this i recorded a bunch of gameplay footage with various numbers of us playing. Now i need to go through them and cut pieces that might resonate quickly with the Xbox owners out there that look at such things. I think this is a tough thing to do, as my favourite bits are not nescessarily the bits that would resonate the best with people seeing my game for the first time. For me, knowing it so well etc, it makes it real hard. Anyway, back to the video editing, in fact i might wait on that and write up what i want in the video. That way i can maybe save on some superfluous video editing time. How many screenshots do ya think would be a good number ? I guess it will depend on what ya want them for eh? Good question. Well i need 4 for the XBox Dashboard when my game is live, so people can see soemthing about the game. I also need some for my Press Pack. So lets see, that really means the question is how many for the press pack? I was thinking maybe 12-20. Seems like a lot 20, but then if several review sites want to feature my game (c'mon, it could happen!). Then i want them to have a choice, so not all sites show the same exact gameplay pictures. Hmm. So 20 seems good. Total then is 24 pictures. So how many should i take before wittling them down to just 24? More after my family and I get back from a quick vacation doing some RVing out at El Mirage and riding our off road bikes. Posted by VoodooChief at 9:14 PM 2 comments Screenshots, so how many? Next up is to work on the video and grab some good screenshots and erm, work on the prose that will entice people to download it. Doesn't sound like much i know, but this will take me a bundle of time. I also need to get the game back into playtest, hopefully for a final time. So, i am gonna start recording some playing now. Posted by VoodooChief at 9:51 PM 0 comments Whats Next? 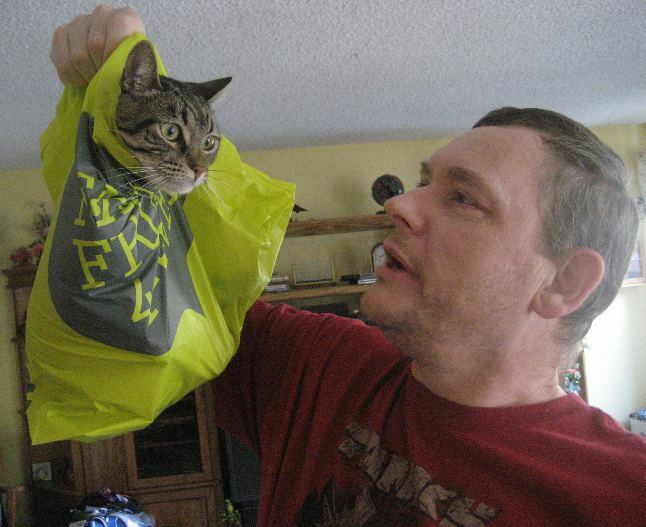 I thought i would post this picture my wife took of me a few weeks back chatting with our cat. It loves to sit in bags and boxes. And doesn't mind being picked up and swung around in them either. I am working on the Xbox save file tonight. It is one of the last major (?? maybe) items that are lying on my list awaiting time to be done. Tonight is the night. I have been feeling quite unwell today, but tonight i am on a nice eve keeled coding spat. So i am working on something that actualy works already, the save game. Only i want to offer prizes out for top scores etc once the game goes live. Not that i will be able to advertsie that in game :( But that is anotehr story and complaint. Onto the happier thoughts. To see scores of course i want them to be shared and have spent a large amount of time getting that working seemlessly. I am happy with that, but i already knew from another Dev that people were hacking the save game files. They are in fact relatively easy to hack being Xml format. So i have decided i want to encrypt my save files so that it will at least stop the occasional hacker. I also have a verification system in place to hopefully stop the next level of hacker up. Time wioll tell if all this actually works well enough to stop people hacking top scores into the save file. I sure hope it delays them more than a month, till i give out the T-Shirt and Hat prizes etc. Still it is a lot of work to stop these unplayed for scores. Wish me luck that i make it hard enough to at least put them off for a while. I mean, is a T-Shirt worth hacking the scores for? Obviously i don't know. It is after all only a small group of people that even sees them, never mind plays them. Mass Media Games is the company i work for and the company that is working so hard on the Home stuff for everyone to enjoy. Poker will be out this Thursday (tomorrow my time), and it will be only a Limited Texas Hold-em style casual game to start with. I say start with as it is destined to be so much more. I am not certain how much miore. I do know they are working on getting a tournemant mode No-Limit style Texas Holdem fully working. Only this will take some major testing once it is ready (it could be ready now i am not sure). I am not sure what the plans are to expand the game into more modes, but rest assured once i find out i'll post about it. I sure hope everyone enjoys the poker table tomorrow, and i hope i get a few invites to play at some point soon. Once i have time and have finished A Shooter for myself. I also hope that everyone enjoys the video we have created to promote Poker, that was a lot of fun to act in. (i am the girl with the Airforce hat on). I have been really excited this last week with my work area. It is in the spare room of my house and takes up way too much room. I know i need an office etc, but that is currently a dream i cannot afford. Below are a couple of photos of the area i work in. The middle monitor doubles usage for the second PC i have stacked under my main dev PC. It has been a real pleasure working on two xboxes. I know the time has come to hand one back to my mate Paul, and i shall miss it dearly. shh.. Don't lok under the table at all those wires and cabling.. it's so busy! 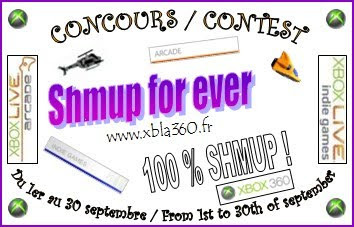 A Wonderful site has created an amazing opportunity for people to win shmup prizes. I donated Pellmell codes as i don't yet have A Shooter out. Otherwise there would have been some of those too. I hope the community sees this and enjoys the opportunity presented here.